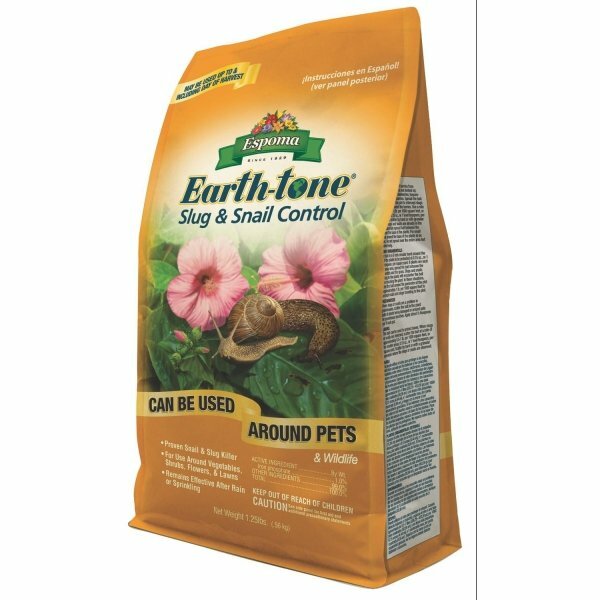 Effective at quickly killing slugs and snails, this soil treatment by Espoma may be safely used around your pet or other wildlife. Apply near shrubs, vegetables, annuals, and perrennials to prevent the destruction of your plants. Earth-tone Slug and Snail Control for Gardens has different options and/or variations, please choose below. Use Earth-tone Slug and Snail Control near your shrubs, vegetables, annuals, and perennials to immediately stop slugs and snails from destroying your plants. A small amount effectively kills slugs and snails, but is safe to use around pets and wildlife. Contains iron phosphate. May be used until the day of harvest. Choose 1.25 or 3 pound bags. Scatter the slug and snail bait granules on the soil around or near the plants to be protected. Do not place in piles. If the ground is dry wet it before applying the bait. The product works best in moist soil with little or no standing water. For use on lawns, gardens, greenhouses, outdoor ornamentals, vegetable gardens, fruits, berries, and citrus.